Looking for spring themed Pre-K centers? Kindergarten centers too? These are for you! 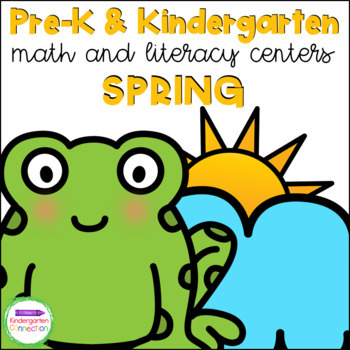 This pack is filled with engaging math and literacy centers for Pre-K and Kindergarten students with a spring theme (see the preview and description below for full details). 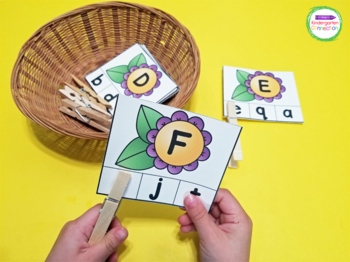 ABC Clip Cards (2 levels) - Clip the letter that matches the letter shown. (Uppercase to Uppercase matching, and Uppercase to Lowercase matching options). “In the Spring…” Emergent Reader (2 levels) - print a simple label style version, or one with a predictable sentence pattern. Copy two-sided and cut in half for two books! 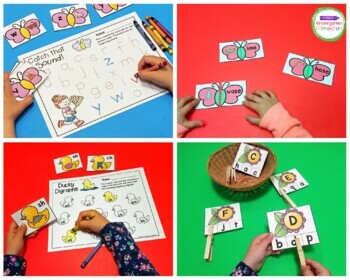 Butterfly CVC and CVCe Puzzles (2 sets) - Complete the butterflies by matching the CVC and CVCe pictures to their words (One set includes words on the pictures for word matching support). Leaping Lily Pads - Pick a frog card and say the letter name. Find and color the lily pad with the matching letter (Both upper and lowercase options included). Spring Nature Write It (Write the Room) – Pick a card (spring themed). Find and record the word next to its matching picture on the recording sheet. * Also includes a coloring version (no writing required, color the matching object). It’s Raining Sight Words (Editable Version Included) – Read the sight words on the umbrellas and then use the raindrops to build them. Recording Sheet included as well. Umbrella Count and Clip - Count the umbrellas in the 10 and 20 frames and clip the total (sets to 20). Egg Nest Count and Clip – Count the eggs in the nests and clip the total (sets to 20). Springtime Roll and Graph – Roll the die. Color a space above the spring object you roll on the graph below. See which one gets to the top first! *Inserts included if you use your own plastic sleeve dice. Let’s Go Fly a Kite – Pick a kite ten frame card and find its match. Fill in the equation to show the missing number to make 10. 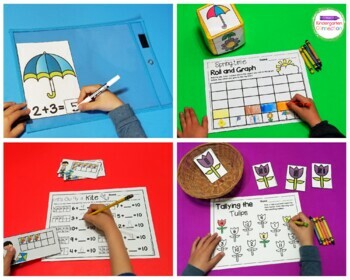 Raindrop Counting Mats – Use playdough or other manipulatives as “raindrops” on the umbrella by reading the number or number words (numbers to 20). Raindrop Addition and Subtraction Mats – use play dough, buttons, or any other small manipulative as counters for “raindrops” to solve the addition and subtraction problems. Can laminate and use with dry erase markers.